Life after What Not to Wear has been far from easy for Trinny Woodall. As she launches a new make-up range she tells Margarette Driscoll, ‘I always have 100 ideas in my head’, and reveals how she found love over the backgammon board. The London street where Trinny Woodall lives is so charming and tranquil – pretty Victorian cottages clad in wisteria, old-fashioned streetlamps – that it is a shock to step through her front door. The place is abuzz: the team masterminding the launch of TRINNY London – her new make-up range – chattering loudly around the dining table, a wall festooned with green, pink and yellow Post-it notes, tubs of creamy make-up piled on top of one another in the kitchen, and above the fray (literally above, as she is a head taller than anyone else) Trinny, in chunky silver Prada loafers and Zara frock. ‘Ah, I need an office,’ she wails, pulling ham from the fridge and spreading cream cheese on crispbreads for lunch (it’s after 2pm), while introducing everyone, showing off her new yellow and silver packaging and talking so fast it is sometimes hard to keep up. Right now, we are sitting next to the bathroom from which Trinny broadcasts her Instagram and Facebook Live feeds to more than 300,000 followers. Trinny’s daily fashion and beauty tips are wise, funny, sometimes wacky but always entertaining. She films herself trying out latest trends (‘which some people say aren’t for women over 35; what rubbish!’) in high-street changing rooms. Back in the bathroom, she has demonstrated everything from dry shampoo to dermal rolling (a treatment involving a roller that makes tiny pinpricks in your skin), to £5 lip-plumping masks. Trinny with her What Not to Wear co-star Susannah Constantine. She broadcasts her Monday musings – weekly, stream-of-consciousness chats – at 6.30am to catch women watching in Australia and the west coast of the US, and at 6.30pm for those of us closer to home. She is sometimes jaw-droppingly frank – regular followers are familiar with her skin issues, her colon and her menopause – but then honesty is her calling card. She admits to having had Botox for nearly 20 years, as well as laser treatments and controversial platelet-rich plasma therapy (nicknamed the Dracula facial, and apparently a favourite of Kim Kardashian). Since last year she has been back on British TV, giving style advice on ITV’s This Morning. From the outside, her life looks perfect. ‘The reality is so different,’ she says. Twenty years ago, as a shopaholic style magpie with an eye for fabric, cut and just the right touch of glamour, she became one half of Trinny and Susannah, the outspoken duo who ‘made over’ frumpy British women in TV’s hugely popular series What Not to Wear. They were perfect foils for one another: Trinny, the skinny (and bossy) beanpole, and Susannah, curvy and voluptuous (and gentle). In newspaper columns they used themselves as models to demonstrate which clothes suited their body shapes. What Not to Wear ran for five series; Trinny and Susannah wrote 11 fashion and style books (selling more than three million copies worldwide). But when they moved from BBC to ITV for a new series: Trinny & Susannah Undress the Nation, ratings fell and the show was canned. They continued abroad, filming 20 series in nine countries but around three years ago the game was up: ‘We were no longer flavour of the month.’ Susannah moved to the country to write a novel (as featured in last week’s YOU). Trinny set to work on an idea for a high-quality, simple-to-use make-up range that could be carried around in neat pots that clicked together like Lego bricks. This germ of an idea has now evolved into TRINNY London – an innovative capsule collection of make-up essentials, tailored (through a specially created digital algorithm) to suit wearers’ colouring, which will be sold online. But just as she was trying to get the project off the ground, life intervened in a most shocking way. In November 2014 Trinny’s ex-husband Johnny Elichaoff fell to his death from the roof of Whiteleys Shopping Centre in West London after a business failure and a long addiction to painkillers following a motorbike accident in his 30s. Trinny was devastated. Though divorced, they had remained close. A serial entrepreneur and former rock drummer, Johnny was a romantic, charismatic character. The first time he proposed, in 1996, he arranged for Trinny to be led, blindfolded, into a chapel in rural Greece lit with hundreds of candles where he was waiting on one knee. Three years later, after they had broken up and got back together he proposed again, this time in her bathroom. The marriage, though happy, was under stress from the start. Trinny was unable to conceive and underwent nine rounds of IVF and suffered two miscarriages before their daughter Lyla, now 14, was born. Later, the couple had seven more attempts at IVF but there was no second pregnancy. So she bought a house in Kensington and took on a huge mortgage, piling stress upon stress. Around the same time, in her mid-40s, she was hit by the menopause. ‘It came early because when you have IVF and remove a lot of eggs the end of your fertility can come sooner. I seemed to lose my energy and positivity. I felt insecure, my emotions were all over the shop. Thankfully, that’s passed now. There might be lots going on but I no longer have that feeling of waking up in despair.’ Because Trinny’s mother had suffered from breast cancer, Trinny opted not to go on conventional HRT. ‘Then I saw an endocrinologist in America – they’re way ahead on this kind of thing – and after a series of tests, she prescribed biodynamic hormones. As well as those, I take turmeric pills for bloating and fluid retention, and I try to get lots of advice from experts. Slowly, she picked herself up and sorted herself out. The sale of her clothes raised £30,000. She met Charles. Things were looking better. And then Johnny died. The day she heard what happened, Trinny’s first thought – though reeling with shock – was for the wellbeing of Lyla, then nine, and due home from school in a few hours’ time. One of Trinny’s recent clips on Instagram shows the two of them on a girls’ weekend in Paris. Lyla has also appeared on This Morning, hosting an item on the clothes children would choose for their mothers. She is a natural on camera. ‘She is, but I don’t want to be the sort of parent that ropes their child into everything they do,’ says Trinny. ‘The line between home and work becomes blurred because I have to keep my social media going, but I don’t overthink it; it is what it is. I feel we’re very close right now and she has good friends and she’s a good friend to other girls and that’s important to take you through life. They decided they would have dinner with her friends, then with his, then have lunch and decide whether they liked one another: ‘Very grown-up,’ she says. 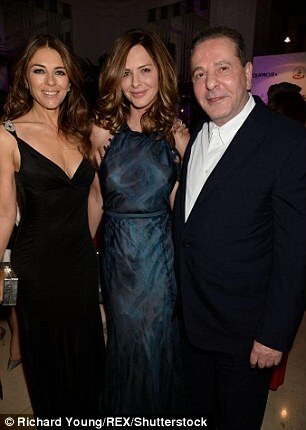 As it happened, she was throwing a dinner party the following evening and sat him between an art historian and her friend and neighbour Elizabeth Hurley. Charles turned up with comedian Harry Enfield and political commentator Matthew Norman. Inside each make-up package is an inscription that says, ‘Be your best…’ It is Trinny’s motto: ‘I think the lasting lesson of making over 5,000 women is the difference in confidence between women who make the most of what they have – intellectually and physically – and those who don’t. The concept behind Trinny’s new cosmetics range TRINNY London is simple: take a cluttered make-up bag and pare it down to a set of neat pots of essentials, tailored to your colouring, that click together for portability. All a woman really needs, according to Trinny, is a good base, blusher, highlighter and lip gloss. Her creamy concoctions are designed to be applied with your fingers – no need for different-sized brushes or applicators. The website helps you find the right shades to suit your colouring. You will be guided through a series of questions about your eye, hair and skin tone, then presented with a refined choice of colours that are right for you. What Trinny has created – after months of development with an Italian cosmetics manufacturer, and having tested the formula on scores of ‘real’ women – is her ideal make-up kit. Previous articleGeorgina Castle is a real Super Trouper in the West End’s Mamma Mia!